Perfect Binding is a process that professionally binds books and magazines with a squared spine. The pages are adhered to each other and to the cover in order to create a sturdy and long lasting bond. The term “Perfect” is used because the finished product is trimmed to have a common edge, leaving the finished product the highest quality available. Perfect Bound materials can be found everywhere such as large catalogs, high-end magazines, hardcover and paperback books. There are two types of Perfect Binding methods: EVA and PUR. EVA (Ethylene Vinyl-Acetate) or hotmelt is a process that uses a hot glue to create the Perfect Bind. The problem is that EVA does not work well with glossy pages, it can’t stand up to differences in temperature, it breaks down over time and is not as structurally sound as PUR Perfect Binding. PUR (Polyurethane Reactive), on the other hand uses a plastic adhesive that takes a little bit longer to cure but creates the long-lasting bond consumers expect. PUR Perfect Bound books are the new industry standard and are used by most major magazine and book publishers. Once a very popular option for creating professional bindery in the office, Tape Binding is now experiencing a resurgence in crafting, small run books and unique presentation materials. With a retro look similar to a sewn spine composition book, tape bindery is actually done with a side stitch or perfect bound method where the hot tape is applied over the piece. 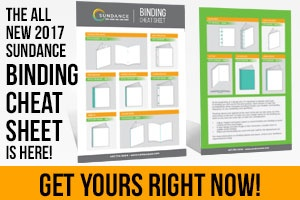 While other options may be more cost-effective, SunDance still offers this bold and intentional, tried and true design choice which can create just the right tactile feel or throwback presentation for your job. SunDance is proud to announce the acquisition of our brand new Pantera PUR Adhesive Binder. This makes SunDance the only printing company in Central Florida with in house PUR Perfect Binding capabilities. Other printers may offer the service, but must send the product out for completion. That makes SunDance the clear choice in Central Florida for complete magazine and book publication production. Printing and Perfect Binding are only the beginning. SunDance is an innovator in the print industry regularly trying new processes and materials to develop amazing results. For instance, digital foil, white ink on clear substrates, and satin or raised UV coatings can add perceived value to any piece. Allow us to shrink wrap, envelope, bag or box your final product. Include additional promo items, create retail ready packaging, distribution identifiers or anything else you need to get your publication in the hands of your end user. SunDance can even ship your final product out to your end users. No list is too large and we can even pair digitally printed pieces to accompany each copy (such as subscription or billing information). Or we can ship it out to you in specified container sizes for your distribution. We can even deliver advertisers tear sheets directly.